If you dream of performing advanced stunts that make the crowd go wild, then the FMX Tricks Pro Scooter by Falconmaxx is a no-brainer. 1 STEP ASSEMBLY – THE EASIEST SCOOTER TO CONSTRUCT, PERIOD. Simply attach the handlebars using the included Hex Key, and you or your kiddo are ready for years of tricks, stunts and fun! Smooth, responsive, stylish stop and go power is at your fingertips for a fraction of the price of lesser performing models. You’ll love every minute you spend rapidly mastering the hottest skate park tricks, or simply let our friendly customer service know and we’ll refund your investment 100%, no questions asked. So go ahead and click add to cart now, you’ll be thrilled you did! BEGINNER OR PRO This Scooter's professionally designed parts creates the perfect storm so you'll be the envy of the skate park looking slick and rapidly master BMX tricks, tail whips, the Hop, Fakie, Manual, nose pivot, 180, No-Footer, No-Hander, One-Hander, AIR, 360 flips and navigate obstacles with ease. REVOLUTIONARY DESIGN The only thing that trumps the stunning black and gold design of this adult stunt and kids pro scooter is its raw power and performance - everything on it is Pro - with 20.5" x 4.5" Flat Deck with Ultra-Grip Tape, TPR Fasen Grips, SCS Compression System, Forged Aluminum Fork, Chromo Steel 4130 T-Bars, 88A High Rebound PU, Quadruple Fitted Clamp. WARRANTY Use it for 90 days. 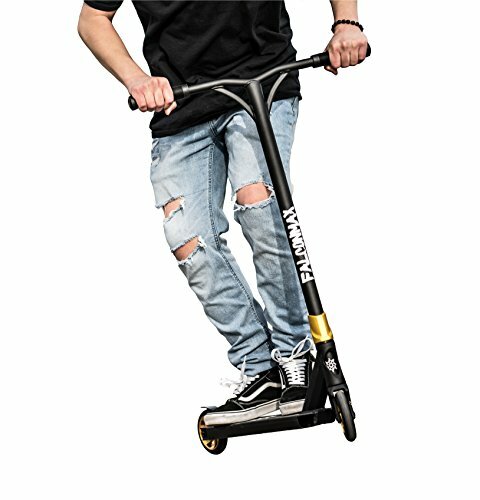 You'll feel 100% thrilled you made this choice and love how it outperforms any pro scooter - or your money back, no questions asked.